Whilst down in London recently I went out shopping for a few bits, and whilst walking round Tesco's I came across an aisle that was full of stuff for £1.00. I was intending on buying a lip balm of some sort as my lips get really dry as the cold weather starts approaching, and I came across lip balms by the brand Lip Silk and they really reminded me of a lip balm that I had been looking at online a few weeks before. 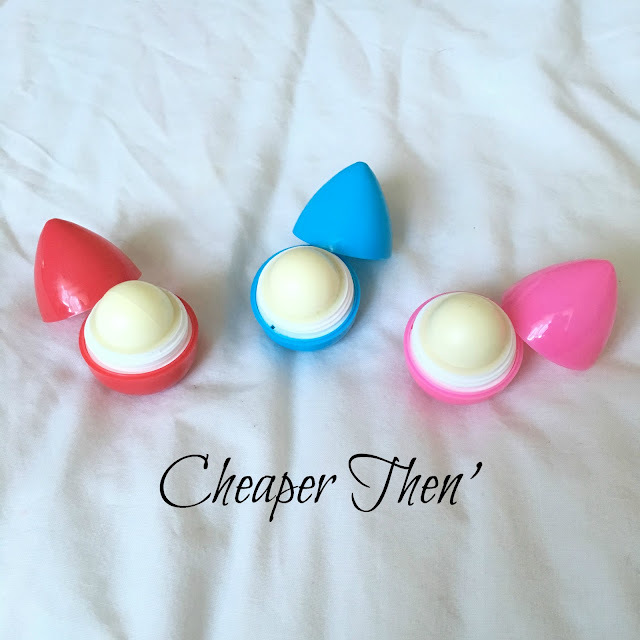 Most of you are probably already aware of the EOS Lipbalms with there gorgeous packaging and unique look, now I nearly ordered a few of these at there price of £6.50 but I'm so glad I decided not to in the end. As I've found a cheaper alternative that is just as good as the EOS ones. The only difference I can see is the packaging on the Lip Silk products looks cheaper as its a hard plastic casing, but the product itself inside leaves your lips feeling soft and moisturised for hours. The ones I purchased where Strawberry, Blueberry and Raspberry flavoured and if they had different ones I probably would have purchased those aswell haha. The strawberry one currently has found itself being left in the car along with a handcream, so that I know I always have them to hand if I ever forget to bring one out with me.